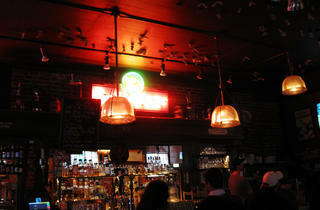 Grumpy’s is a classic drown-your-sorrows after-work joint: It’s small, dark, friendly and cheap. Other than the corner TV, which is usually turned to the Giants, the dollar bills stuck to the ceiling and a large painting of the bar’s bulldog mascot qualify as ambiance. Since it’s at the north end of the Financial District, the pub’s convivial crowd is mixed. You’ll find construction guys throwing back beers on one end of the bar and Levi’s dudes downing whisky out front. Most come to take advantage of the daily drink special—a pint and a shot of Jameson, Jäger or Fernet for $7 (5–7pm)—alongside the satisfying, no-frills Grumpy’s burger.